Any construction site is a dangerous place to work and even stay for a short period. Beams being hoisted, carts wheeling by, and heavy machinery all around mean that workers have to be cautious all the time. Although a home construction site is much less dangerous, that doesn’t mean that it is 100% safe. Even if you are the only worker, there are still numerous dangers lurking and you have to make sure you are safe. This means adopting safety rules and habits, as well as getting the right gear, from the helmet all the way to protective footwear. However, home improvement novices more than often omit a piece or two of protective gear which might cost them their toe or finger. One piece of garment that almost two-thirds of all builders forget to put on are protective glasses. They have only one function, to protect the eyes but for some reason, people still perceive them as a fashion statement rather than an integral protection for the eyes. There is all kind of debris flying around the construction site, like wood splinters and metal chippings, which could cause havoc if they land in your eye. A foreign body in the eye can even make you lose your eyesight, turning your long-awaited home improvement project into a nightmare. That is why you should wear inexpensive plastic eyeglasses every time you do any construction work. Apart from the eyes, you are going to have to protect your ears as well. Since power tools generate a lot of noise, up to 100 dB, constant exposure to such high tones can lead to hearing damage or even hearing loss. That is why earmuffs should be put on before you turn on a power saw, for instance. They need to have a padded outer area so they comfortably fit the area around the ear since you will be wearing them for hours at times. Probably already known to you, every piece of protective gear has to be ergonomic. An alternative to earmuffs are earplugs which provide less protection and they are less comfortable but some prefer them due to their small size which makes them easy to store in a pocket of the overalls. 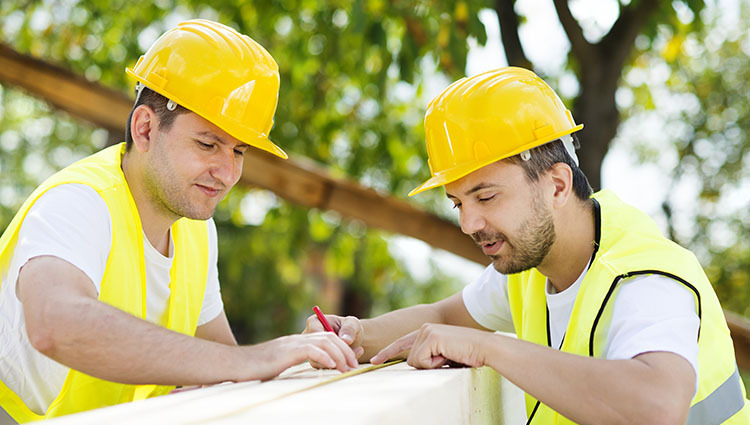 When you think of construction site safety, the yellow helmet is probably the first thing that comes to your mind. While protection against falling objects from above is important, you need protection from below as well. There are a lot of nails lying around so you run the risk of stepping onto one of them or you can simply slip on a liquid that spilled on the floor. This is why it is important to have proper footwear in the form of steel cap boots that will protect your feet from kinetic energy. Dropping a heavy beam or hitting your toe on an edge will become a thing of the past with adequate boots. Once your toes are safely encased by steel, it is time to protect your fingers. Wearing gloves is highly recommended because they have numerous advantages. Obviously, they will protect your hand and fingers from injury, as well as protect the skin. Gloves will enable you to carry timber without having to worry all the time will a splinter remain in your hand when you are done. Also, your hands will not blister while working with hammers or similar tools with a handle. Appropriate gloves are usually made from leather that is both durable and elastic enough, so you will have full mobility of all five fingers. This is essential when manipulating power tools that have minuscule buttons that need to be pressed hard. If you’re sanding the floors or are exposed to any other source of dust, you need to protect your nose. There are masks and respirators that stop all the fine dust particles from getting inside your nostrils and all the way to your lungs. Some materials that you work with, like fiberglass and asbestos, are toxic so it would not be wise to handle them without a respirator on. Applying any of the five methods listed should only be the beginning of your gearing up during home improvement projects. Remember, a new front porch will look nice but safety should come first!